Another Yankee is heading to the disabled list. 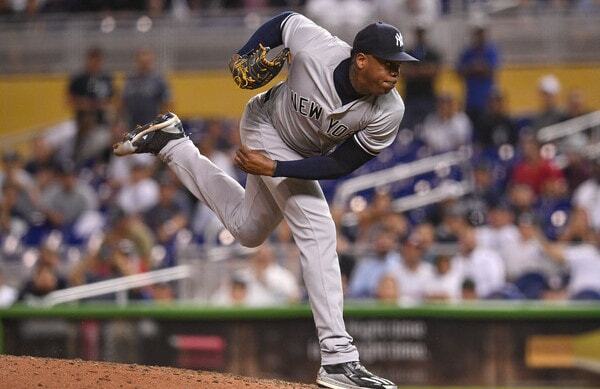 Aroldis Chapman has been placed on the 10-day DL with left knee tendinitis, the Yankees announced. The team has not yet announced a timetable for his return. Chance Adams was called up from Triple-A Scranton to fill the roster spot. The Yankees have a deep bullpen with no shortage of replacement closer options. My guess is Zach Britton will get the first crack at the job, though it could also be Dellin Betances or David Robertson. Whoever ends up closing, the other two will join Chad Green and Jonathan Holder in the setup crew. Chapman joins Didi Gregorius (heel), Aaron Judge (wrist), Gary Sanchez (groin), Clint Frazier (post-concussion migraines), CC Sabathia (knee), and Jordan Montgomery (Tommy John surgery) on the disabled list, among others. Good thing the Yankees are pretty much locked into a postseason spot, huh? Would stink to lose those guys in the middle of a heated race. Adams was scheduled to start for Triple-A Scranton today and that means he’s available for very long relief, which we all hope isn’t necessary. There’s a pretty good chance Adams will be sent down after tonight’s game since there’s an off-day tomorrow and Sabathia is coming off the disabled list Friday.